(Newser) – An explosion at a US airfield in Afghanistan early Saturday killed four Americans—two service members and two contractors, CNN reports. 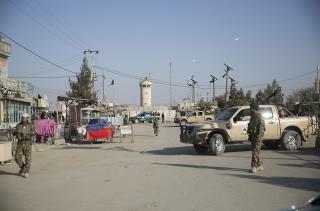 Another 16 US service members and a Polish soldier were injured in the apparent suicide attack inside Bagram Air Field. According to the AP, a statement from NATO's Resolute Support mission said the blast happened around 5.30am and that "force protection and medical teams are responding to the situation." US Defense Secretary Ash Carter says he's "deeply saddened" by the attack. RIP OUR GUYS! A FATWA ON THE MUSLIM SAVAGES! Those despicable cowards, attacking on Veterans Day. Don't they realize that it only strengthens our national resolve, to grind them into dust? What a dreadful thing, for the families of those men. Wait until Trump puts warhawk John Bolton in his Cabinet. Bolton never met a war he didn't like, so look for more boots on the ground.